Dunajska Kapelye has been performing together since 2006, but their roots go way back to the origin of folk music itself – to a time when people travelled free from the cares modern life, when they gathered their inspiration from the natural world and played music together to commune with those around them and remember those that had gone before them. 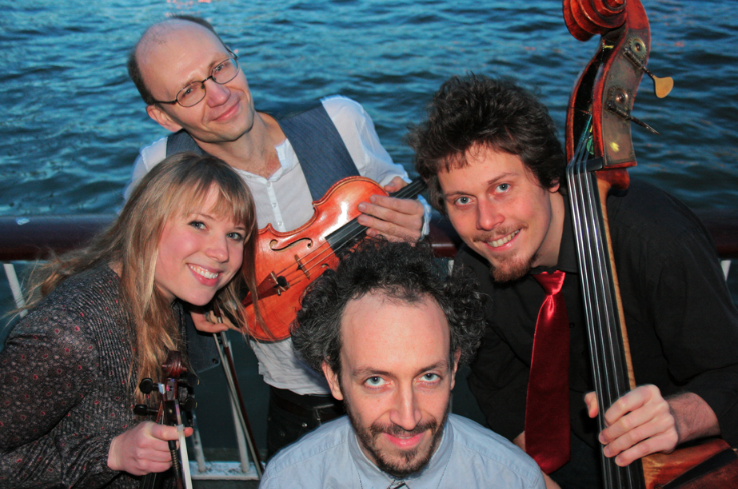 The band draws its influences from everywhere the Danube flows (hence the name, which translates as “the Danube Band”) and from wherever their fancy takes them – Romania, former Yugoslavia, deepest Russia, Ottoman Europe, the Jewish Shtetl, Django Reindhardt’s Belgium and Edith Piaf’s Paris. In particular, they are indebted to the Roma people (commonly called “Gypsies”) whose music is a testament to the range and depth of the human soul. Led by Piotr Jordan‘s many-hued and ever-virtuosic violin playing, the band’s approach is truly authentic; there are no fancy arrangements, nor is there a sense of stylistic reverence that many other bands who play in this genre aspire towards. Instead, each time they play they offer genuine and unabashed renderings of songs that are close to their hearts and that are never the same twice. Jez Cook‘s manouche guitar, Zac Gvirtzman‘s accordion/clarinet, Flora Curzon‘s violin,Jiri Slavik/Raph Mizraki‘s double bass, Ronen Kozarko‘s percussion andGina Boreham‘s vocals make up the full complement.